Go to Edit > Preferences > MIDI - Devices. In the Inputs list, make sure that the MIDI Input driver or drivers that your controller/surface uses are selected. 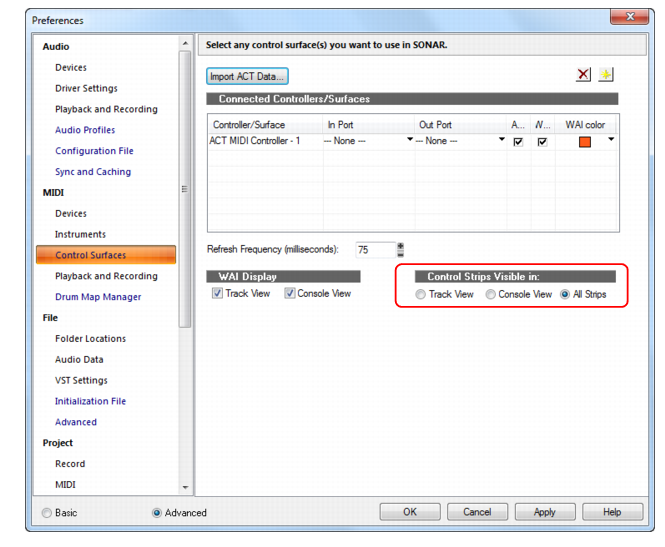 If you have a bi-directional controller/surface (one that both sends and receives data in order to control a software application), also make sure that the MIDI Output driver or drivers that the controller/surface uses are enabled in the Outputs pane on the right side of the dialog box. Follow your controller/surface’s instructions for physically connecting your controller/surface to your computer (you may need to close Cakewalk first). In Cakewalk, go to Edit > Preferences > MIDI - Control Surfaces. Click the Add Controller/Surface button , which opens the Controller/Surface Settings dialog box. In the Controller/Surface field of the Controller/Surface Settings dialog box, find the name of your controller/surface, and select it. However, if you want to use Active Controller Technology, or if your controller/surface is not listed, select either the Cakewalk Generic Surface or the ACT MIDI Controller. Note: The Cakewalk Generic Surface plug-in is not bi-directional. In the Input Port and Output Port fields, select which MIDI input and output ports the controller/surface uses. Note 1: You may need to read the documentation for your controller/surface to find out which MIDI input driver your controller/surface uses to control software applications. If your controller/surface includes a MIDI keyboard, your controller/surface might use one MIDI input driver for the controller/surface functions, and a different MIDI input driver to send MIDI notes and pitch bend data to the application (the piano keyboard functions). Note 2: Control surfaces retain their current MIDI port assignments even if you add or remove MIDI devices. If any assigned MIDI port is missing when you load a project, Cakewalk will let you remap each missing port to an available port. For more information, see Changing MIDI Output devices. Click OK to close the Controller/Surface Settings dialog box. In the Preferences dialog box, make sure that both the ACT and WAI check boxes are enabled, and click Close. Important: If your controller/surface needs to be in a certain mode, or have a certain memory preset loaded in order to control a software application, put your controller/surface in the proper mode or load the required memory preset now. Now that your controller/surface is connected, you can see which tracks and/or buses are being controlled by it by looking at the colored markings (the WAI display; see The WAI display for more information) in Cakewalk’s interface. If you selected the ACT MIDI Controller plug-in or the Cakewalk Generic Surface plug-in for your controller/surface, you can load a default set of mappings by opening the property page for either plug-in, and selecting the name of your controller/surface from the Presets window in the property page. Cakewalk allows control surfaces to display all channel strips in a project, or only the channel strips that are visible in the Track view or Console view. Track View. The controller/surface matches the channel strips that are visible in the Track view. Console View. The controller/surface matches the channel strips that are visible in the Console view. All Strips. The controller/surface shows all channel strips in the project. The controller/surface immediately refreshes and displays the specified channel strips. Figure 489. The Control Surfaces section. In the Controller/Surface column, click the name of the controller/surface that you want to disconnect. Click the Delete button , which deletes the name of the controller/surface that you selected. Control surfaces are refreshed by posting a windows message every 75 milliseconds. You may want to increase the value of this Cakewalk.ini variable if you are experiencing sluggish UI responsiveness when using a control surface and playing back high CPU projects. Also, if you are using a control surface that is not bi-directional, the surface does not need to be refreshed at all and you can safely increase the value.